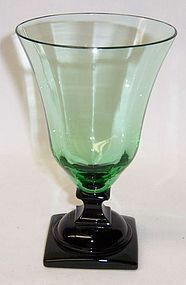 This is a really great depression glass era green Barrel, aka Oaken Barrel, Dresser Jar or Powder Jar with Lid. This Powder Jar measures 4 1/4 inches in diameter X 3 inches high to top of knob. Both the Powder Jar bottom and lid are in very good condition with no chips or cracks. This Powder Jar is listed in Margaret Whitmyer's Bedroom and Bathroom Book of the Depression Years. We guarantee items to be as described. THANK YOU. 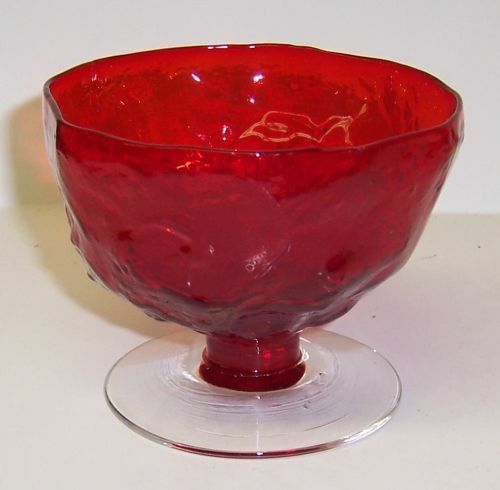 This is a really pretty ruby red, with crystal foot, Driftwood 2 3/4 inch high footed Sherbet Dish made by Seneca Glass. This sherbet measures 3 1/2 inches diameter across the top. It is in very good condition with no chips or cracks. Be sure to search our other elegant glass available. We guarantee items to be as described. THANK YOU. This is a really pretty pink Frances 12 inch Round Footed Serving Plate made by Central Glass in the 1920s to 1930s. This Plate is in excellent condition with no chips, cracks, scratches or cloudiness. We guarantee items to be as described. THANK YOU. 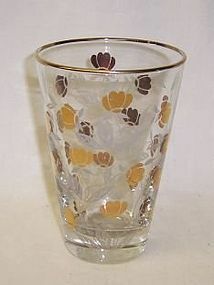 This really pretty Line Number 1451 5 3/4 inch high Footed Tumbler was made by Central Glass Works. This Green Optic top Tumbler has a black base. It measures 3 1/2 inches in diameter at the top and is in very good condition with no chips, cracks or scratches. We guarantee items to be as described. Feel free to email any questions. THANK YOU. This pretty frosted Banded Autumn Leaf 5 1/2 Inch Water Tumbler was made to accompany the Hall China Autumn Leaf dinnerware. This Tumbler can be hard to find. It measures 2 3/4 Inch in diameter across the top and is in very good condition with no chips or cracks. Be sure to search our other Autumn Leaf items available. We guarantee all items to be as described. Feel free to email with any questions. THANK YOU.